Loooooooong picture-ful post. It is advisable to view this when there is wifi or the pictures would zap up your data. 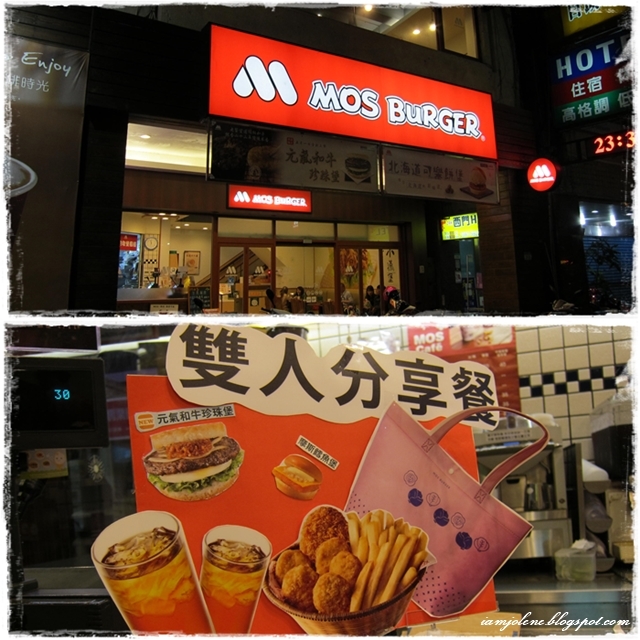 My last Taipei Throwback post was a year ago and this post has been in draft for 8 months! I ought to be shot. It continued to rain the following day even after a whole day of rain the previous day. Showers were expected the next few days and we had wanted to do day trips out of Taipei city for our remaining two full days in Taipei. We could not possibly coop ourselves indoors and not tour around for the rest of the trip. Hence, we proceeded with our Day 4 plan. We decided to take a day trip out of Taipei main city to Jiufen (九份) on our 4th day in Taipei. As usual, we started our day with Lu Rou Fan (滷肉飯) or in English, braised pork rice. Looking at the grey dreary skies taken from the MRT, we knew the torrential rain would beat on and it would be a hassle to tour around outdoors. It was rainy and foggy. 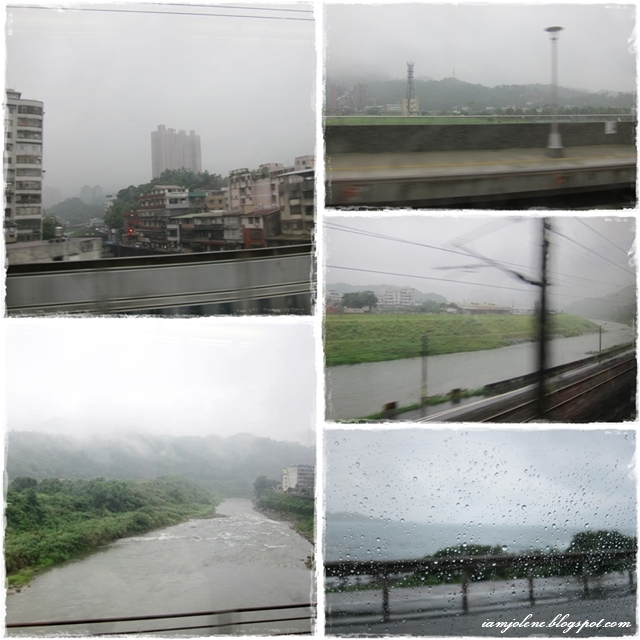 It was drizzling when we reached Ruifang Station so we decided to hop onto a cab after checking with the driver if he could drive us to the various tourists attractions around Jinguashi town before heading to Jiufen. Most people would google for recommended taxi drivers in Taipei. For us however, it was an impromptu decision to grab a cab and Quan Ge (Brother Quan) wasn't too bad. Jinguashi (金瓜石) is a town in Ruifang District, New Taipei City, Taiwan. It is notable for its historic gold and copper mines. "Situated between the mountains and the coastline, Jinguashi boasts exceptionally beautiful scenery as well as an abundance of historical relics from the erstwhile mining days, making it an ideal tourist spot in northern Taiwan." It was too foggy to make out any King Kong's head, bird cage or pregnant lady on Keelung Mountain so I snapped this instead. This is supposed to be the Yin Yang Sea (陰陽海). On a non-rainy and non-foggy day, you would see a mix of yellow and blue in the bay. Due to the pollution from nearby mining activities in the past, local belief has it that the colouration of this bay was caused by chemical runoff. Yet, even many years after the closure of all mines, the unusual hue of the water remains. It turns out that this colouring is a result of the insoluble floating iron ions from the heavy concentration of pyrite (also known as “Fool's Gold”) in the area. The name Yin Yang derived from the ancient Chinese principle of the natural concept of duality, balancing and complementing. Just as with the dichotomy of light and dark, or cold and hot, the Yin Yang Sea expresses a natural balance of yellow and blue. It was a pity we could not see any yellow and blue in the sea that day. There are many other notable places of interest to visit at Jinguashi like the Gold Museum, Jinguashi Shinto Shrine, The Gold Ecological Park etc. However, we did not have the luxury of time and simply did a touch, snap and go. It was good to be driven around especially in this bad weather. I sometimes do not agree with the phrase "as changeable as the weather". But look... foggy in the picture before this and then the next moment, the fog began to clear up! The phrase holds true. A little flash flood occurred along our drive. Shuinandong Smelter (水湳洞精炼厂) also known as The Remains of the Thirteen Levels (十三层遗址) looked impressive even from a moving vehicle. For more knowledge on the smelter, hop over here. 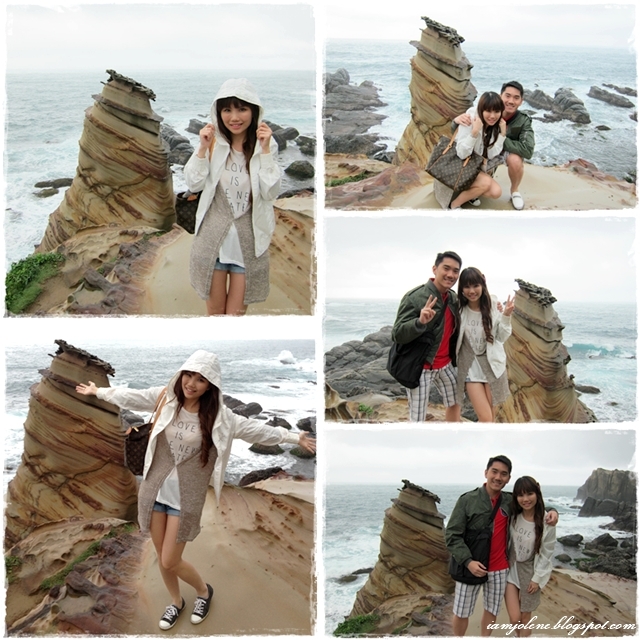 Next, Quan Ge took us to see the Nanya rock formation (南雅奇岩). The artwork of coastal rocks were formed when these rocks undergo weathering from the waves and winds over a long period of time. There are rocks of all shapes and sizes which had undergone various types of weathering process. This particular rock formation is the most popular one to snap. We were intrigued by the yellow and brown swirls that look like sand but is actually rock hard... or hard rock, either way. Gotta snap one "I've been to Nanya" photo for Instagram. It really is just a small little formation but popular nonetheless. See I told you our taxi driver was very cute. He gestured for us to pose in this manner as if we were having a wedding photoshoot. Hahaha! To be honest, I'm not very sure if this area is called Nanya Rock Formation or is Nanya just the name of the first rock. Upon googling, I got more and more confused. Anyhow... here is a "We've been to Nanya" shot. Next, we visited the Golden Waterfall (黃金瀑布) located near the Gold Ecological Park. For more beautiful photos of the Golden Waterfall and the reason behind why it is golden, head over to this blog. It started to rain more heavily and we got the whole waterfall to ourselves because everyone else was scrambling away to the nearest shelter. You can't see the rain drops from the photos but you could see how soaked we were. Last stop would be to explore Jiufen Lao Jie (九份老街) till night fall. We bade goodbye to Quan Ge when he dropped us off at Jiufen Old Street. I took an instant liking to this quaint, nostalgic little place like a scene from a movie. 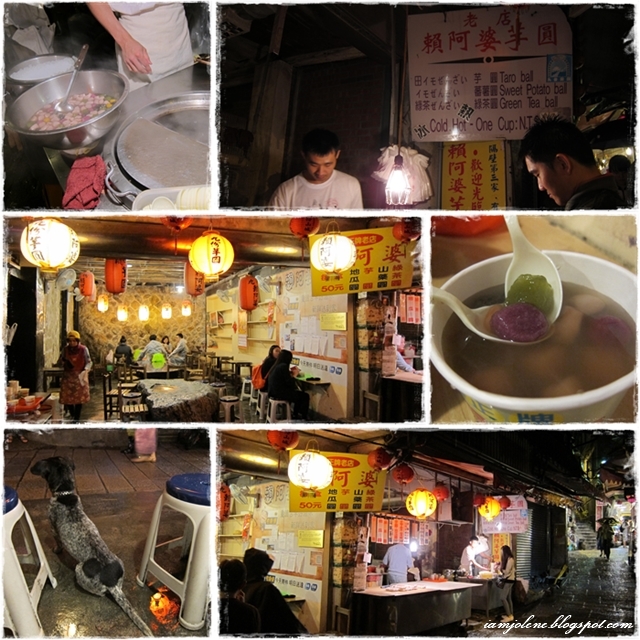 I often wondered how Jiufen got its name and consulted my good friend, Google. The rain was a blessing in disguise as there weren't throngs of people milling about that day. It was totally opposite from what I read about how the crowd of tourists could get really annoying pushing one another from the back, rendering it impossible to stop and shop along the narrow and steep lanes. While I was mesmerized by the charm of Jiufen like foolish flies to dazzling lights, the hubz was attracted to the array of food like a greedy pig to swine feed. 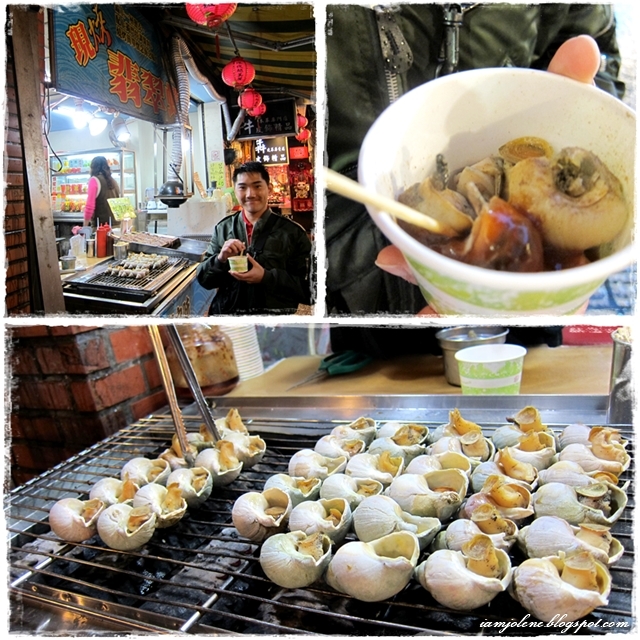 He could not resist the Taiwanese style escargot. I simply called them snails. I had to replace my broken sling bag and so bought a little cross body bag from this shop. I was so pleased with my buy until I realised that the bags were all made from real leather. Before that, I had been on a self-imposed ban from buying leather goods. No wonder everything smelled so good in the shop. The hubz read that many bloggers raved about Ah Lan Hakka glutinous rice cakes (阿蘭宇粿/草仔粿) and bought a few flavours to try while I was shopping. He bought two savoury ones and a sweet one to try. The savoury ones tasted really unique. Not too bad at all. This little kitty led me to a shop selling lots of kitty souvenir. I had the sneaking suspicion that the cats and the owner had a ploy to lure cat-loving tourists to their shop. I did not want to snap too many pictures without buying any souvenir, so here is a picture to show just the sort of kitty souvenir sold there. These are cat massagers by the way. As the drizzle became heavier blobs of rain, we decided to seek shelter and have some warm snacks at Lai Ah Po Yu Yuan (賴阿婆芋圓) also known as Grandma Lai’s Yu Yuan. Yu Yuan means taro balls. The taro balls are made fresh at the stall. You could see the whole cooking process at the stall. This sweet dessert is available in hot or cold. Since it was a cold rainy weather, we opted for a bowl of warm comforting taro balls. Best choice ever! This dog at the taro ball stall had been out in the rain. On a completely unrelated note, the stripe down its back reminded me of a dwarf hamster. Taipei is a city of cats and I was drawn to this shop because of all the cat decor outside. I could not resist posing for silly shots with this happy kitty. I managed to snap some of the many cat paraphernalia in this shop... Just the PURRFECT place for a cat lover. Postcards of various artwork of cats. This cat knows how to oppa gangnam style! 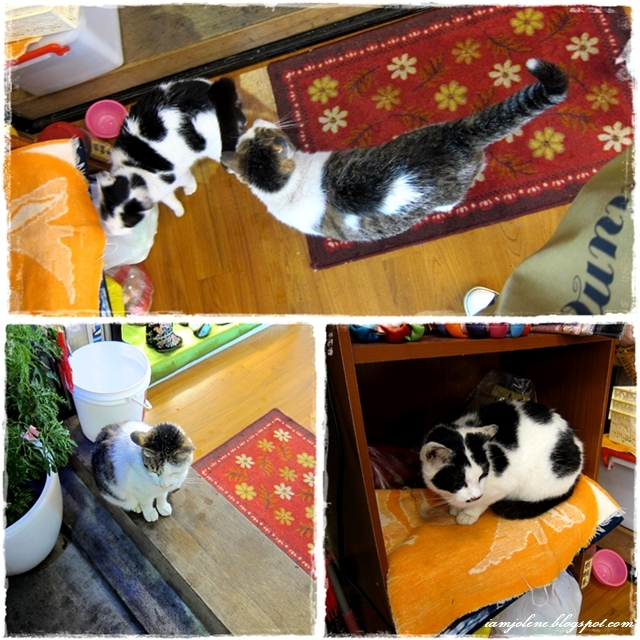 These cats were darting about inside and outside of the shop. I love how Taiwanese stray cats have such unique fur coats. 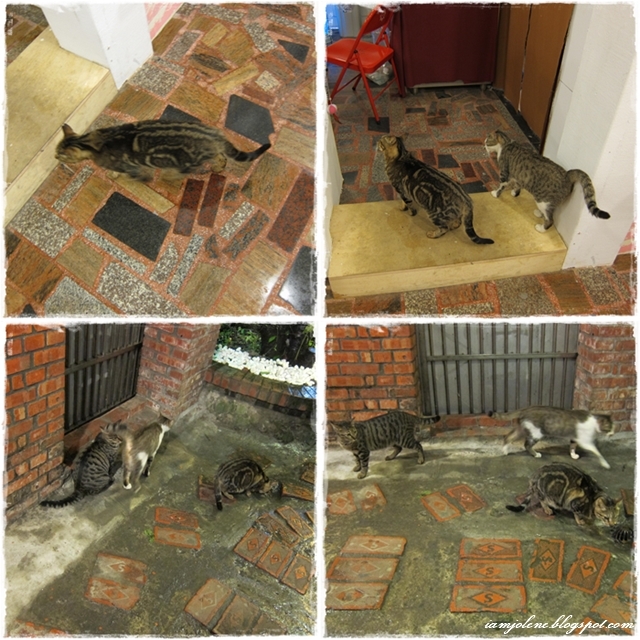 We don't usually see such swirls on the fur of stray cats in Singapore. I do not usually like the sight of red lanterns as I think they look eerie. Blame Chinese horror shows. But why oh why are the red lanterns lining the streets of Jiufen such a beautiful sight to behold? There is simply so much old world charm in Jiufen. The bad weather caused us to start our day late but if not for it, we would not have spent the evening and night in Jiufen. It was indeed a blessing in disguise yet again as we could witness the beauty of the village in the day and at night. When in Jiufen, one must never miss sipping tea in a traditional teahouse. We chose Ah Mei Tea House (阿妹茶楼) as it is well-known to be the inspiration behind the building of Yubaba in Spirited Away, an animated movie by Hayao Miyazaki. Somebody wrote about how Jiufen is the inspiration for Spirited Away with various juxtaposition of scenes in Spirited Away and Jiufen. It is quite an interesting read so hop over here if you are curious. 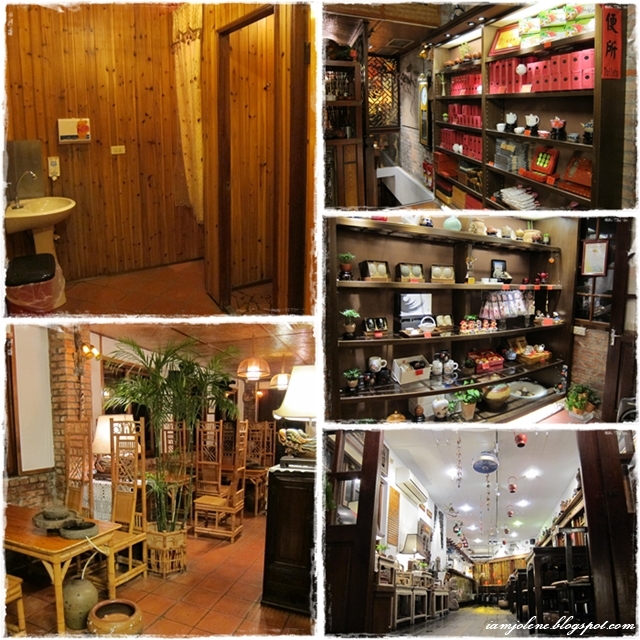 "Ah Mei Teahouse was originally a blacksmith shop run by Ah Mei's grandfather who made tools for local miners. With the rise of the tourism industry in Jiufen, Ah Mei transformed the blacksmith shop into a teahouse with her experience in teahouse operations." We were so enthralled by the menu which was written on traditional bamboo slabs, just like those from the olden days. The hubz pretended to be some Chinese scholar studying the menu. To be honest, our Chinese brains could not process how to read the menu so we used our Chinese tongues to ask the staff for recommendations instead. For a start, the server would prepare the tea for you. Afterwhich, you could try doing it yourself or if you screw up, just holler for the server to assist. We could not remember which tea set we ordered (I think it was the Oolong tea) but we loved the whole experience of sipping tea at such a beautiful tea house. Drinking tea is such a fine art with elaborate steps that I would have to let the video do the talking. Pardon my hubby's silliness at the end of the video. He either thought I was taking a photo or did not know this would be up on YouTube. OMG! I LURVE the green bean pastry! 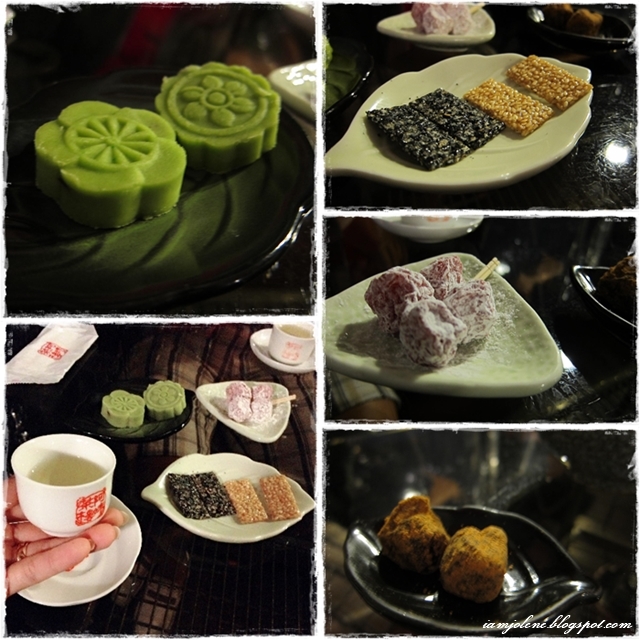 That's the best thing I've eaten in Jiufen and I wished to have more of it instead of the other overly sweet snacks to complement the tea. You know, we often drink Chinese tea in Singapore but somehow, drinking Chinese Tea at the famous Ah Mei Tea House is an entirely new experience. 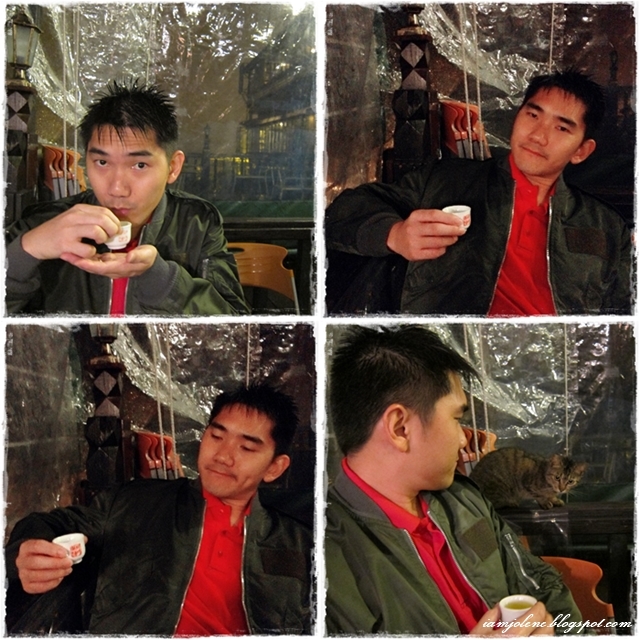 The hub's tranquil tea appreciating moment was broken by the presence of a cat emerging from the ledge behind him. Cats really love to disturb him. Psst... cats know who hates them and would purposely disturb them more. 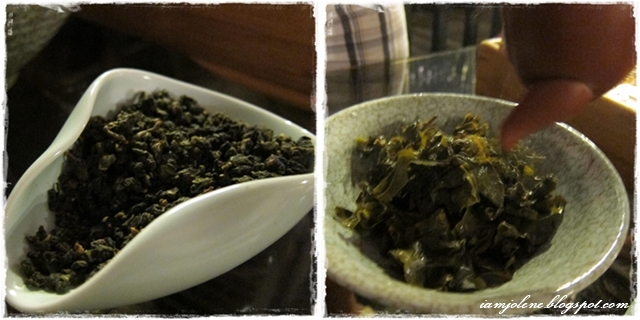 The tea leaves before and after. It was time for us to do it ourselves and we didn't screw up coz the hubz paid attention! I love the architecture and decor of the tea house. The view from the window is awesome. Had the weather been clear, the rain covers at the top deck would be lifted and we would be able to enjoy the mountainous view by night. Let's pause for a bimbo moment coz Jo insisted, "I want to take a shot of the pretty view by the pretty window!" "I feel like I'm in a hobbit or dwarf's house..."
"... descending this little stairway." The outside of the teahouse is just as dazzling and captivating as the inside. We seemed to be the only denizens around. So we started to snap snap snap. Red lanterns had never looked so beautiful in my life. Obligatory "We've been to Ah Mei Tea House" wefie. 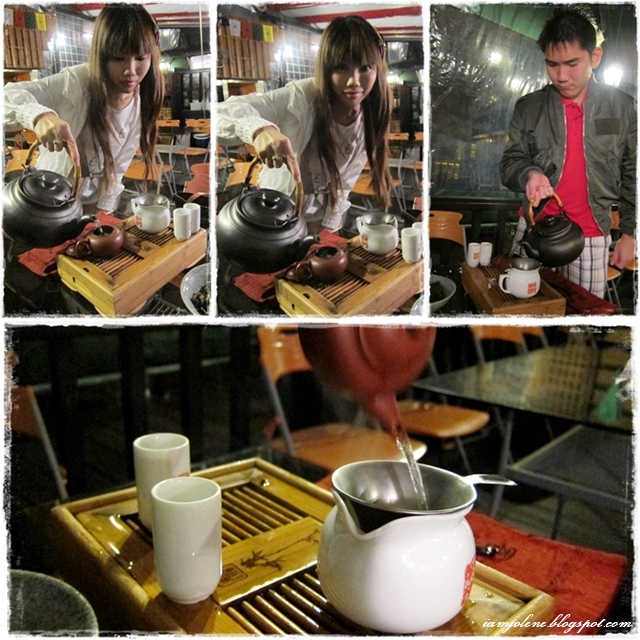 We strongly recommend visiting Ah Mei Tea House if you want to experience tea culture in Jiufen. Steep steep steps and lane. It was too late to try the coffee at Jiufen. Craving for bubble milk tea all of a sudden. Jiufen simply emanates history and culture. It is definitely one of my favourite place in the whole Taipei trip. Rustic charm, narrow lanes, steep steps, red lanterns, mesmerizing architecture... Till we meet again! Me is a Chinese and me don't like this dialect spelling of Jiufen. This curious looking cat beckoned us to Jiufen in the near future with its "I know you love Jiufen" knowing look. When it stopped raining, the night mountainous scape looked like this. ... and where tea houses look so modern and cutesy. First time seeing a harp player as a street busker. 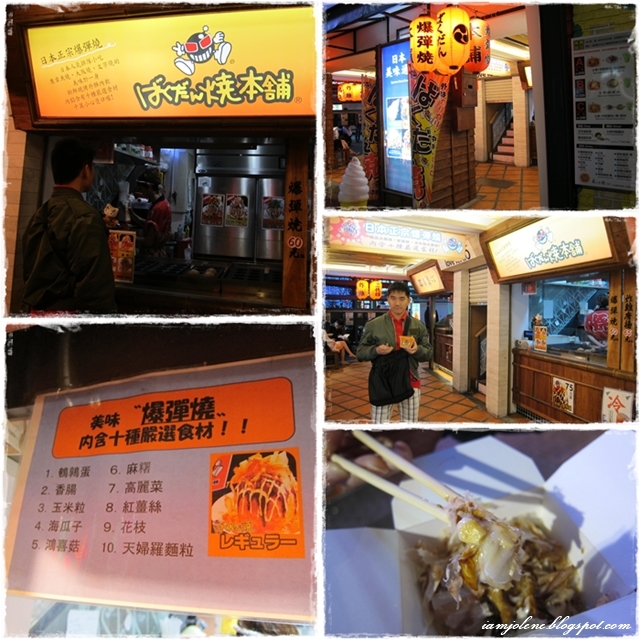 We merely ate light food at Jiufen and got hungry by the time we reached Taipei City. We had buddy meal at MOS Burger and got a free recycle tote bag. Our meal did not look as nice as the poster but of course, right? Before heading back to our hotel, the greedy hubz simply had to eat again. He kept buying all sorts of street food in Taipei. As long as it was something he did not see in Singapore or something he read about, he would buy. "See this cat in the cup sooooooooo cuuuuuuuuuuuute. You buy la. Look so innocent and stupid. 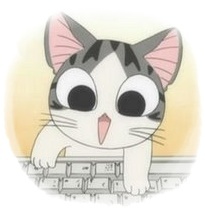 Sooooooo cuuuuuuuuuute." I hope to end off my Taipei Throwback updates soon. The impetus for continuing my Taipei Throwback posts is strong especially when I see daily hits from Google search on various attractions in Taipei and get emails and comments on whether I would continue to update on them. 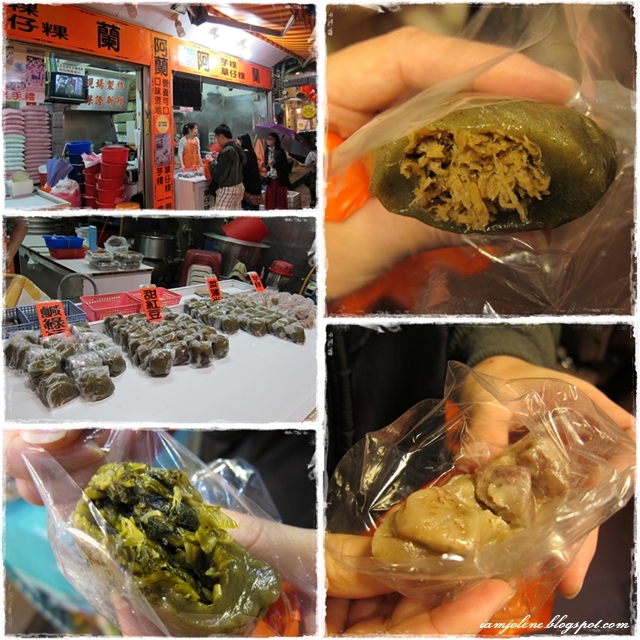 While waiting for my next Taipei post on Shifen, you could read my Taipei updates as listed in chronological order. Till then!